Mulch makes green plants "pop"
This is an example of how mulch makes the green plants "pop" with color. 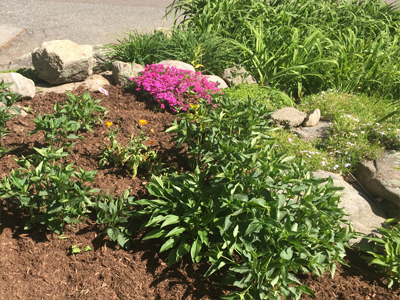 Proper (natural) mulching is great for the plants. It can keep the weeds to a minimum and can help your plant root systems from being exposed to the elements such as extreme heat and from the extreme cold. Weeding must be done prior to mulching as it will not stop the growth of already established weeds. It simply reduces the amount of weeds that would surround your plants. 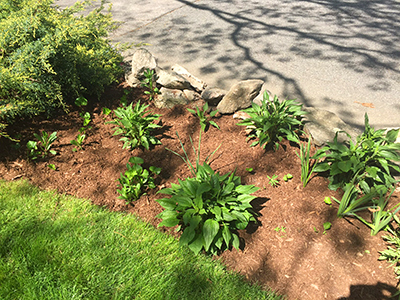 The proper color of natural mulches can enhance any garden and turn a bland area into eye popping one fairly inexpensively. Copyright © 2016 Jordan Brook Lawncare and Gardening LLC; All rights reserved.